After much teasing, we finally got to watch the official first trailer for Red Dead Redemption 2 from Rockstar Games. Par for the course of any Rockstar Games release, we can’t tell too much from the first trailer, especially since the story and its protagonist — or protagonists — have not been confirmed. But if you take the time to watch the trailer over and over, there are a few details that could give some insight into what we can expect from the game when it finally drops in fall 2017. So saddle up, pray for no delays, and check out some of the details in the trailer that could be big hints about what will show up in the main game. The scenes in the trailer are very brief, but they could explain a lot. There are several scenes of characters using various modes of transportation. Some of these travel options include horses, which are a given, and stagecoaches. But we also see a train and a canoe in the trailer, so we might be able to use these vehicles for fast travel options. If the leaked map that TechRadar presented is legit, then we’re probably going to be seeing a lot of empty spaces between settlements in this open world game, so having options to get around would be nice. 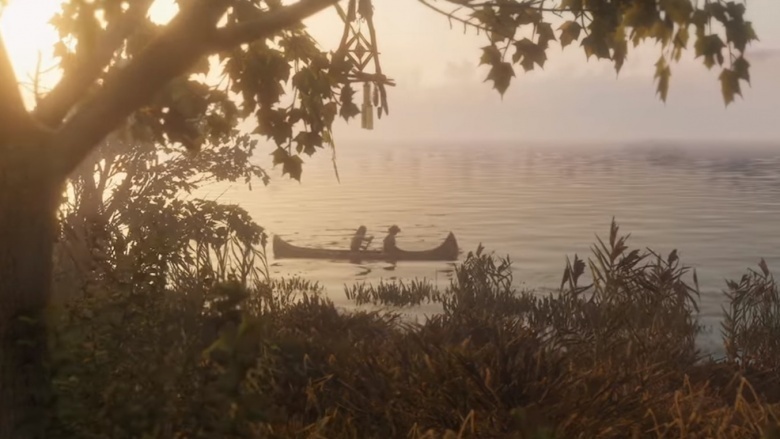 Maybe the presence of a canoe indicates that we’ll be able to swim in the game, too, since attempting to tread water in Red Dead Redemption meant an insta-death. How jaw-dropping is this camping scene, with the Milky Way hanging overhead and lighting up the trees? It looks like the ability to camp will return, letting our protagonist refill his health and energy, as well as refill our ammo. The fire is also useful for keeping predators at bay, so we don’t wake up mid-maul at the claws of a mountain lion or something. We’re expecting to see an expansive world that will keep us exploring away from the homestead, so setting up shop with a portable campsite is going to be pretty clutch in the untamed wilderness. If you’re able to travel with a posse, it’d be great to see some campfire stories being thrown in the mix to give some more character to the NPCs. Whenever you went hunting in Red Dead Redemption, you’d have to carve up your kill and then take the materials to a shop to sell your goods. In the trailer, there’s a scene of a man using his nag to carry a dead deer back to what looks like his home. Maybe this means that you can provide for your family, assuming your character has one, and can bring back kills directly to your home. You could probably even just carry your haul to the local general store and sell it off there for even more money. It may or may not take longer than simply carving off pelts and riding away, but the reward could be worth the trip. 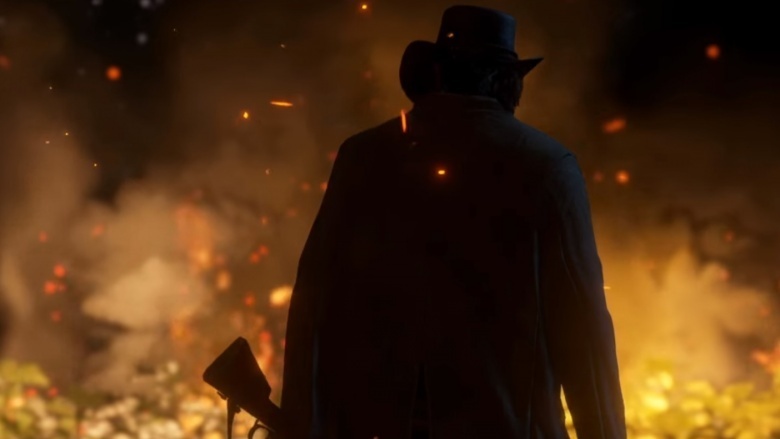 We aren’t told upfront in the trailer whether Red Dead Redemption 2 will be a sequel to John Marston’s story or if it’ll be a prequel that takes place during John’s time in Dutch’s gang, but one scene in particular might hint at it taking place in the past. 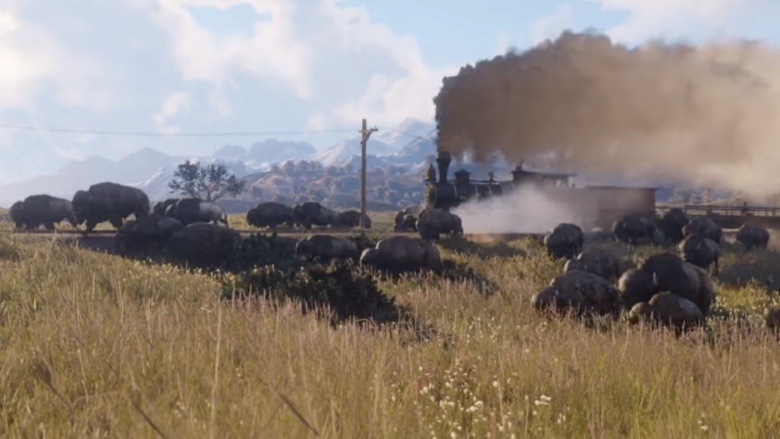 In this scene, we see a herd of buffalo running alongside a train. In the original Red Dead Redemption, events took place just at the end of the Wild West era of the United States and buffalo numbers were dwindling. There was even a secret achievement called Manifest Destiny that players could earn after hunting down all of the 20 buffalo present in the game. Seeing them in plentiful numbers here indicates that we’re probably further in the past when they weren’t yet wiped out. Given all the scenes we see of houses and farms, there could be a portion of the game that focuses on building up a homestead and maintaining it. 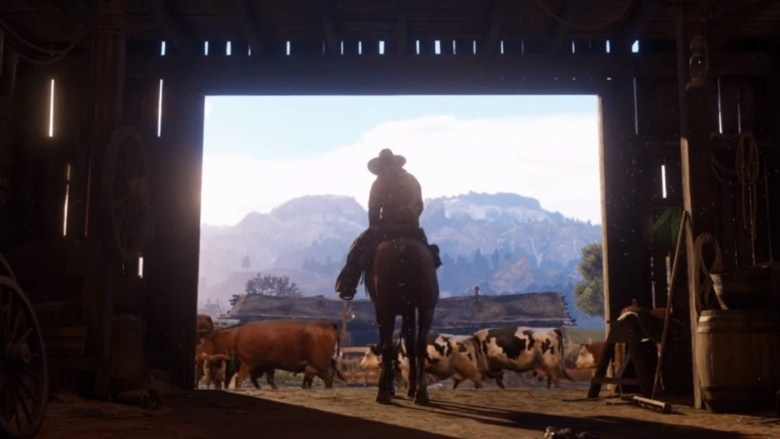 Whether this means hiring farmhands to take care of cattle or wrangling them yourself is unclear, but seeing this character saddle up inside a barn as cattle move across the property indicates this could be a feature. You could establish your homestead as a base of sorts, and you might be required to defend it from invading NPCs or player-characters in a possible multiplayer mode. Maybe there’ll be some firefights on the farm. We only hear one voice in the trailer, and we’re never given any hints about who could be speaking. It doesn’t sound very much like Rob Wiethoff, the voice of John Marston, nor does it sound like Benjamin Byron Davis, the voice of antagonist Dutch. It does, however, sound a bit like voice actor Troy Baker, the voice behind characters like Booker DeWitt from BioShock Infinite and Delsin Rowe from Infamous: Second Son. The voice says, “When the time comes, you gotta run and don’t look back. This is over.” This is all very foreboding and definitely indicates that a great change is going to come. 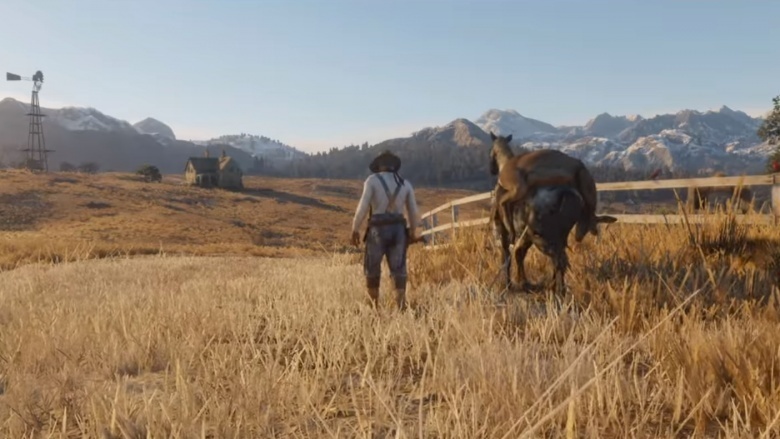 Maybe it even alludes to when John left his old life behind and left Dutch’s gang. The seven riders at the end of the trailer call to mind the image of the Magnificent Seven. 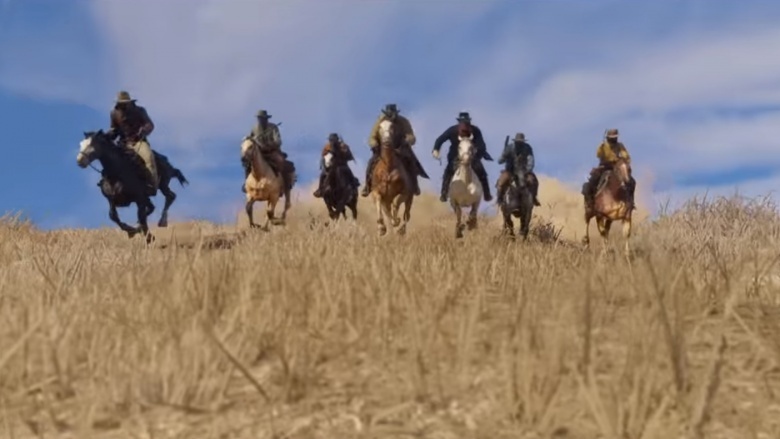 It could also hint at the possibility of having multiple protagonists, just like in Grand Theft Auto V. Whether or not we’ll be able to experience the stories of all seven, or even any, of these men is unclear, but we’re hoping that’s the road Rockstar takes with Red Dead Redemption 2’s narrative. The presence of so many riders could also be a nod to the focus on multiplayer that Rockstar’s been lauding with each tease of the game. If we’re able to form our own posses with our friends online, the hype levels would probably just skyrocket. 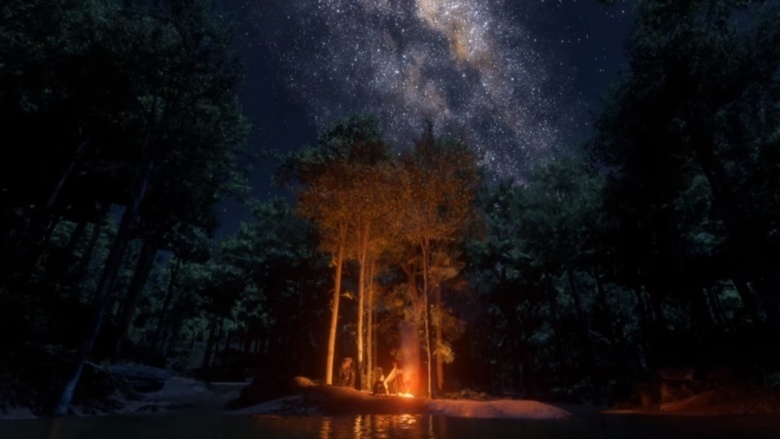 It’ll likely be some time until Rockstar trickles out more information about the game, but these are just a few things we could glean from the brief images they showcased in the initial teaser trailer. We wait with bated breath for more Western goodness. Rathnagiri Bore: Once pristine, lumberjacks make it ‘bare and bore’!